Digital whiteboard. Chromium™ web browser. Easy screen sharing. SMART Board MX series has all the essentials educators need to bring the devices students love into any learning environment. Available in 4K Ultra HD resolution in 65”, 75” and 86” sizes, MX series is a great value for schools looking for an affordable alternative to classroom projectors. The SMART Board’s built-in iQ technology puts everything you need in one place, available at the touch of a finger. There’s no need for wires and cables. 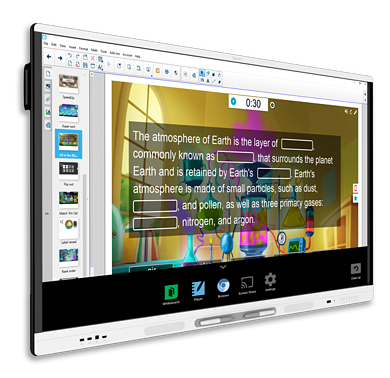 The embedded computer offers one-touch access to the robust SMART Learning Suite applications for interactive lessons, game-based activities and online co-creation. There’s also access to collaboration tools, like the built-in web browser and wireless screen sharing.